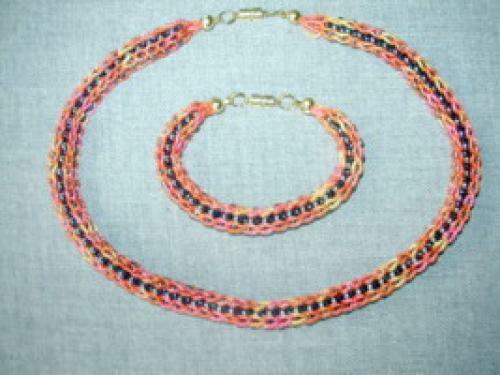 Beads sit within the braid and are added after each stitch. Kit includes - 10yds Lurex, 25g size 6 rocailles, magnetic fastening, threading needle and instructions (includes instructions for necklace 3 - beads round edge & 4 - beads round both edges). Bead colours will vary to match or contrast with yarn, according to availability Required Knitting Nancy, scissors and PVA glue. Bracelet is shown to inspire but not included in kit.